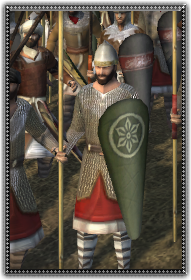 Although dismounted warfare is unusual in the vastness of the desert an Ayyubid commander who decides to lead infantry into battle will rely on these troops as the backbone of his army. Jund spearmen wear light chain mail and a heavy spear particularly effective against cavalry. Their proper use can make the difference between an utterly defeat and a successful battle.